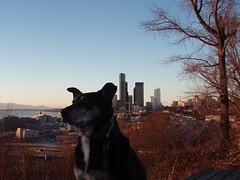 Tica enjoying Jose Rizal Park back in January. Photo by melissajonas. For six years, Tica and I have explored the neighborhood, from Pac Med to the stairs on Lucile Street, but we spend the most time between College and Spokane. The north-south streets are more gently sloped, but I also enjoy the east-west hills and stairs for the incredible views and great workout. We also frequently visit Blue Dog Pond (an off leash area on Massachusetts) and occasionally stop at the dog park at Jose Rizal or the informal dog run at Pac Med/Amazon. Taking Tica for a walk is more than just exercise, for both of us. It’s a chance to check on construction progress at the light rail station, notice “for sale” signs, and admire gardens. It’s also a fantastic socialization opportunity for both of us. Often — especially on these sunny days — we wander slowly around a few blocks and stop to see neighbors in their yards. Tica is getting older and slower, and appreciates a chance to lounge in someone else’s parking strip while I stand at the gate and gab. She also looks forward to the treats and belly scratches many of our neighbors generously dispense. When I’m with Tica, people smile and say hello. They ask what kind of dog she is (I don’t know, probably a Blue Heeler mix), where we live (McClellan), and how progress is going on our house (it’s coming along). These basic conversations helped established relationships in a neighborhood evenly mixed between old-timers and people who just moved in. Sharing pet stories opened doors — often literally. People will invite us in to see the latest progress on a project, or ask if Tica needs some water. Slowly, over time, these sidewalk conversations are turning into invitations to dinner and exchanges of phone numbers. Walking the dog has given me the chance to see and appreciate my neighborhood in a way that I don’t take for granted. It’s a chance to catch up on the latest news (I get the latest void updates fresh from the source), get restaurant reviews, and celebrate (or commiserate) what’s going on in the lives of our neighbors. Even if you don’t have a dog, I encourage you to get out and walk a few blocks. Especially right now — all the flowers are blooming and everyone’s yard looks great! I’m looking forward to sharing my pedestrian experiences on the blog. Thanks to Wendi and Jason for the opportunity! Great post! I’m a little further south (Columbian Way & Beacon Ave) and love walking the neighborhood with my Australian Shepard. Sometimes we walk north along Beacon to the library. I love the cool shade of out tree lined sidewalks. Beacon Hill is definitely underrated in my humble opinion. Hi David–thanks for your kind welcome. I also appreciate the shade, and the well-kept yards. Beacon Hill is great!